Experiencing a world of wonders. Santorini, the most beautiful island in the world! Walking through the traditional white-washed houses with their azure-domed roofs and brightly coloured bougainvilleas, set on a volcanic cliff-edge overlooking the blue Aegean Sea. It is the perfect picture of what most of us envision when we dream of our travel to Greece. We are here to help you materialize that dream! Stroll down the picturesque paths of the mysterious ancient Caldera and experience the most romantic of sunsets… a captivating Santorini landmark. Experience the pleasure of enjoying your dinner with local wine in one of the restaurants or cafes, idly hanging above the Aegean, taking in the breathtaking view. Discover the charm of the traditional villages while taking in the cosmopolitan atmosphere. Explore the amazing archaeological sites and museums and learn all about the island’s fascinating history. Fantasy merges with reality on this most fashionable island, come live the dream. Elevate your senses. Aroma of Santorini (4 hours) opting for this half day private tour will have you discover an exquisite spot of Santorini accompanied by a local, friendly, experienced guide in the village of Melagochori. We begin at Gavalas Winery, a truly unique and breath-taking location, ideal for wading into the process of vinification and discovering indigenous grape varieties, while sampling local wine. Then, we will then head to Fira, the capital of Santorini. You will enjoy the beauty and fame of Caldera by walking around its narrow streets embellished with typical small white churches with blue domes, trendy and traditional restaurants and boutiques. Its landscape is one of the main attractions and perhaps the most characteristic of the whole island. The view of Fira town, a coveted Santorini landmark, is shown on countless postcards. 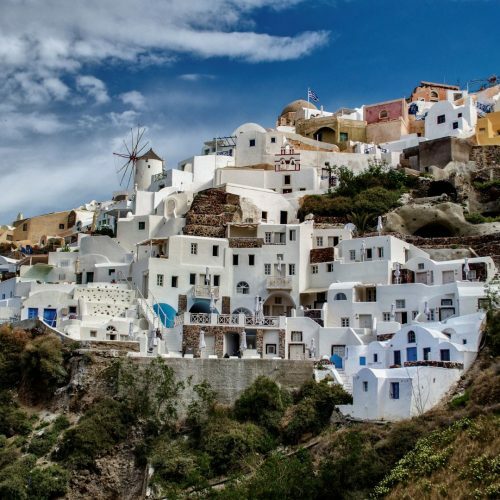 The tour then moves to Firostefani settlement which has a marvellous view of the Caldera, different to that from Fira and the famous little white church with the blue dome. Embrace the best of Oia’s Village, the most photographed location in Greece, unique in every way with the magnificent and world renowned sunset and landscape, and the small white houses with the splashes of rich okra, deep fuchsia, cobalt blue, oyster pink and earthy red. The secrets of Santorini in 6 hours. Embark on an essential 6-hour tour of Santorini with our friendly local guides. Admire breath-taking views from Firostefani, which has sweeping views of Santorini’s whitewashed buildings. Delve into the fascinating village of Oia, where bright white houses with cobalt blue roofs line the hillsides. Visit the charming village of Pyrgos, with its narrow alleys and picturesque houses where a venetian castle and defensive tower dated from the Middle Ages can be found. Relax and taste the traditional cuisine of Santorini at a local family tavern on Perivolas Beach, known for its black volcanic sand. Meet an oenologist specialist at Gavalas Winery and learn to distinguish the tastes and aromas of Santorini wines. Sip three distinct wines, all produced locally. Raise your glass for this extraordinary Santorini experience of a lifetime! Taste good life at Santorini. Coming to Santorini and not experiencing a wine tour, offering such a colourful spectrum of unique and truly local grape varieties, would be a true loss. Live the wine experience, visit the top sights of Santorini and have an introductory 5 hour winemaking tour. Hear about the ancient vineyards of Santorini, the history of the island through the centuries and how the rich volcanic soils influence and add instinctive notes to local winemaking, renderings its produce unique throughout the world. Are you prepared to see how wine is made from the harvest to the final process? 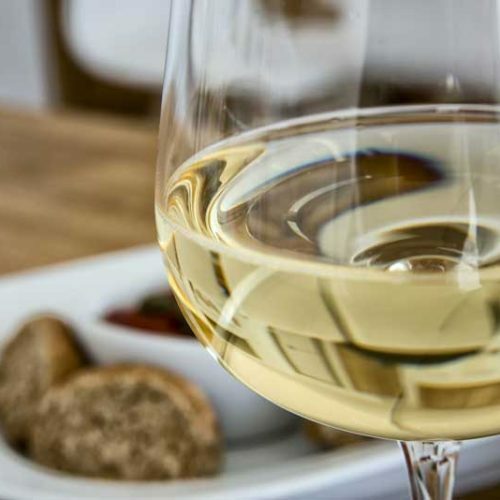 We will have the opportunity to visit 2 traditional wineries and explore 10 different wines such as the distinctive Assyrtiko, the tasteful Nykteri and the sweet Vinsanto which are served alongside local delicacies. Embark on a journey to the world of Santorini wines and learn all about the grape varieties and their end result as wines. How do Santorini’s microclimates and volcanic soils affect the flavours and notes of its’ wines? Get introduced to a bounty of secret corners of the island only a local would be able to show and tell. Both wine experts and experienced tour guides will be your escorts on this unique Santorini private tour. We then continue to discover the traditional village of Pyrgos, the highest village in Santorini with a typical Fortress Settlement which was declared a protected UNESCO settlement in 1995. On the hilltop, you will find ruins of Kasteli Castle, one of the five `Kastelia`, found on Santorini island. Let’s raise our glasses! Traditional is so hip, come see why! Perpetually talked about and captured in majestic photos, this unique island hosts many villages all of which hide a piece of history. Yours to discover! Our Hidden villages tour highlights the traditional side of Santorini. Experience the island off the beaten path with this 6-hour private tour, accompanied by an experienced guide. Visit hidden places, churches, local fish taverns and restaurants including the village of Megalochori which is characterized by hundreds of small white houses, sprawling vineyards and beautiful churches. Continue to Emporio village with narrow walkways and picturesque houses where we find a Venetian castle and fortress date from the Middle Ages. Our final stop is the volcanic beach of Perivolos, a seemingly endless stretch of black sand. Here you will have free time for a refreshing swim on this infamous beach. Savour the traditional dishes of Santorini, Greece at local family beach tavernas or enjoy the summertime entertainment in this unique beach. through the volcanic land of wonder. Discover “the unspoiled Santorini” while following walking paths through wild flowers, lush valleys, ancient sites, and old pathways. Meet the locals, savour wine with them, and do food tastings in restaurants and tavernas with a choice of three Santorini private tours. Gear-up and be prepared to be astounded… Our excursion begins in Fira with hiking along the cliff-side of the Caldera. Choose to begin this route early in the morning to avoid the heat or late in the afternoon in order to enjoy the sunset. The walk takes about 3 hours and once we arrive in Oia, we will walk through the traditional village in order to discover the way of life of its inhabitants during the 19th and 20th centuries. We will have the opportunity to see its beautiful mansions and homes built within caves hanging on the cliff side above the sea. Our intention is to involve you in a special and unique adventure that includes beautiful scenery of Oia, breath-taking landscapes and picturesque architecture. After this long and eventful hike, we will replenish our calories with delicious souvlaki and taste the best homemade ice cream in Santorini. An air-conditioned bus will drop you off at your hotel or the starting point. Let’s wonder around! There is an ancient path that used to connect the three villages and it’s ours to discover! This uncompromisingly scenic private tour takes you through paths and fields leading through to the hidden village called Potamos with its small farmers’ houses. Our path leads us to Emporio with its narrow alleys and picturesque houses where we can find a Venetian castle and fortress dating from the Middle Ages that will leave you speechless. Emporio is the largest settlement of Santorini located 12 km from Fira on the foothills of Mount Prophet Elias. It’s strong medieval character and the Kasteli are well preserved and radiate the cycladic character of its architecture. At the entrance of the village stand two lovely, blue domed Cycladic churches with impressive bell towers that dominate Emporio. This is the location that inspired Sartre to write the famous play “The Flies” (Les Mouches), so be ready to relive history. Our path will lead us through the fortress to a traditional Greek coffee shop where you can enjoy the famous Greek yogurt with local fruits & honey. Charge your cameras and cell phones; you will be snapping a large number of photos on this private tour! On our way back, a bus will wait for us for the hotel drop-off. in Santorini, Greece… just for you! Full day at the Pompeii of the Aegean. On this full day, Santorini panoramic (6 hour tour), accompanied by a friendly and experienced private guide from Golden Ibex, you will explore the excavation of Akrotiri, one of the most important Prehistoric sites in the world. The volcanic ashes preserved two and three-story buildings, full of decorated walls with breath-taking Minoan frescoes. 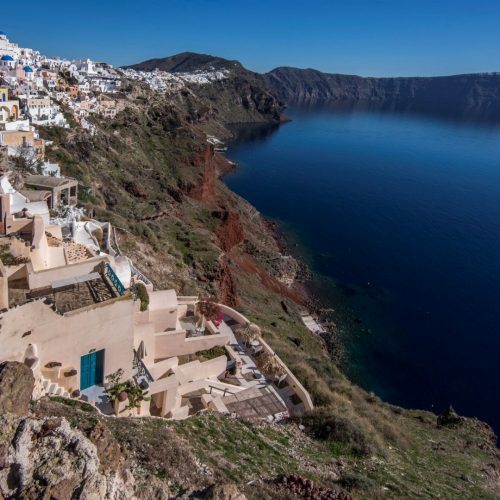 Next, you will admire breathtaking views from the island’s highest point at the mountain of Profitis Ilias, 567 meters above sea level with panoramic views of the entire island, all the way to the village of Oia. We will discover the traditional village of Pyrgos, the highest village in Santorini with a typical Fortress Settlement which was declared a protected UNESCO settlement in 1995. On the hilltop, you will find ruins of Kasteli Castle, one of the five `Kastelia`, found on Santorini island. The best of Santorini in a nut-shell…If you are visiting Santorini by cruise ship, you can rely on us for an unforgettable experience ranging from mini private tours around the most important landmarks, sights and monuments of the island to a tour around the island’s rare volcanic beaches in order to enjoy the crystal clear waters of the Aegean Sea. We will make sure you will make the most out of your limited time on the island by having a great time on the diverse island of Santorini. Air-conditioned and non-smoking mini buses guarantee comfortable private tours. All our local tour guides speak fluent English, have acute knowledge of the island’s history and they are here to present you the local way of life and how it has been shaped and moulded through time. Santorini offers numerous places of interest which are unique in their own way and definitely worth visiting. Contact us in Golden Ibex and provide us the details regarding your arrival, the number of participants and basic interests… we will organize a private tour that appeals to your needs and tastes; a private tour you will always remember! Because we’ll not only guide you through some of the most charming, hidden corners of Santorini, but we will also shed new light on the most famous spots. When arriving in Santorini by cruise ships, they will normally anchor in the open just by the Volcano and our visitors are brought to either Athinios or Old port by tender. This happens due to the fact that the main port is not deep enough to accommodate big cruise ships. However, approaching the island on a smaller vessel is a unique experience in itself! Those who purchase a Santorini tour from a cruise line are brought to Athinios port, the main port of the island, (20 minutes drive from Fira). The Old port offers an altogether different alternative. With this option, you can reach Fira either by donkey (yes, you read correctly) or by the cable car in a mere 5 minutes for the latter. Taking the traditional way of donkey riding is exciting and gives a glimpse of how things were in the old days. Please note however that donkeys do not take you all the way up and you will need to walk a small distance in order to reach the centre of Fira. The Golden Ibex team recommends the cable car as it is the safest and quickest way to the town centre. As soon as you reach the cable car exit, your private tour guide will be waiting for you to start your selected excursion and help you live the ultimate Santorini experience. When only the best will do… Anyone trying to plan a holiday with a fun-filled itinerary knows how time consuming it can be. The professional tour experts of Golden Ibex are here to take care of the nitty-gritty details and assist you in making the right decisions in booking any service; from transfers to all types and styles of accommodation in Santorini, integrated wedding planning services and nuptial trips, as well as private tours and activities that suit your personal taste, interests and time spent on this magnificent island… You are never alone on your journey! Golden Ibex concierge is an exclusive concierge service in Santorini, Greece dedicated to providing our clients with the highest level of service. For those looking for more personalized and specialized services, VIP SERVICES will surely meet your needs and guarantee that your private tour will be unique, enjoyable and trouble-free. We will do our utmost best so that your Santorini stay will be a unique experience of authentic style and elegance. We offer the highest level of personalized travel, transportation and cutting-edge entertainment services to corporate executives, celebrities, professional athletes and other discerning individuals interested in living life to its fullest. You can be next! Whether you are visiting for business or leisure, Golden Ibex team and personal concierge experts can offer you a complete VIP lifestyle. Contact us and our team will provide you with a special a la carte package, made to suit your needs.